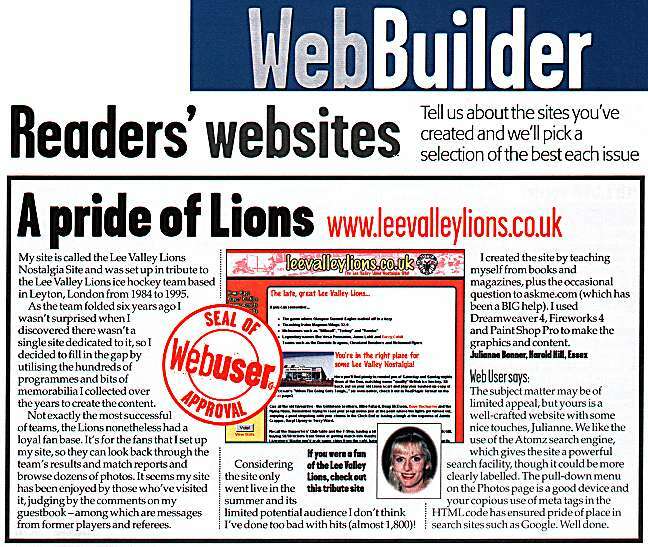 The one and only Lee Valley Lions Nostalgia Site! … then you’re in the right place for some Lee Valley Lions Nostalgia! Cue all the old favourites – the Goldstone brothers, Mike Fafard, Doug McEwen, Dave Ducharme and the Flying Finns. Remember trying to read your programme just at the point where the lights got turned out, enjoying a good singalong with your chums in the Clock End or having a laugh at the expense of Jamie Crapper, Daryl Lipsey or Terry Ward. Recall the Supporters’ Club table and the T-Stop, having a bit of a gossip with Mike Cook or Jack McGill, buying 50/50 tickets from Steve (how come we always had the smallest crowds but got bigger 50/50 winnings?!) or getting match info from announcer extraordinaire Peter Livermore! Maybe you’d grab some chips from the café, hang around for the Man of the Match awards (not that the Lions would ever skate round the ice afterwards, of course) then chill out and drown your almost inevitable sorrows up in the bar! Those were the great times to be had in E10. Let your memories live on! What’s on the site, then? A variety of Player Profiles – their hockey backgrounds, hobbies etc. Season-by-season match results. You can view the results for a particular season and then check out stats and comments for a large number of individual matches. Details of the various leagues the Lee Valley Lions played in over the years, including end-of-season standings (NB to spot the Lions look towards the bottom of the tables!). Lots and lots of photos. Team photos, player photos, on-ice action shots, you name it. Many were taken from the LVL programmes, others were taken by myself and the remainder are from credited or unknown sources. See how many faces you remember. If you have some photos of Lions players that could be added to the site please get in touch! Some extras to remind you of the Lions and match nights at the Den. I’ve included various bits of team memorabilia, plus newspaper reports and pages from the Clock End Times in PDF format (on the Lions in Print page). Best of all, there is now a multimedia section where you can listen to some of the songs associated with Lee Valley (Billy Ocean’s “When the Going Gets Tough…” being one of them) and even watch some video clips. Lastly, a site-specific search engine to help you steer your way around. Just type what you’re after into the box at the top of the page – couldn’t be easier! 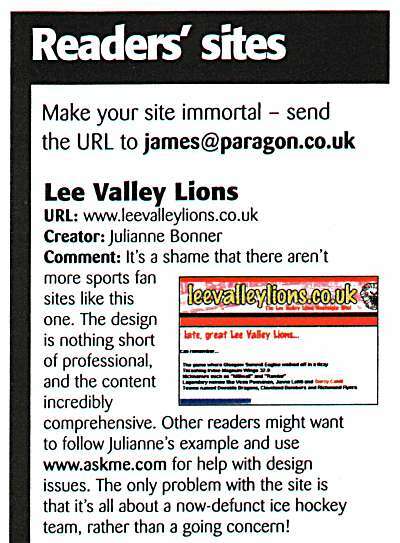 See this site immortalised in national internet magazines Practical Internet (Feb’02) and Web User (6-20 Feb’02)!